As a small business owner every penny counts! Don’t spend gobs of money building a super duper fancy schmancy web site until you can afford it. 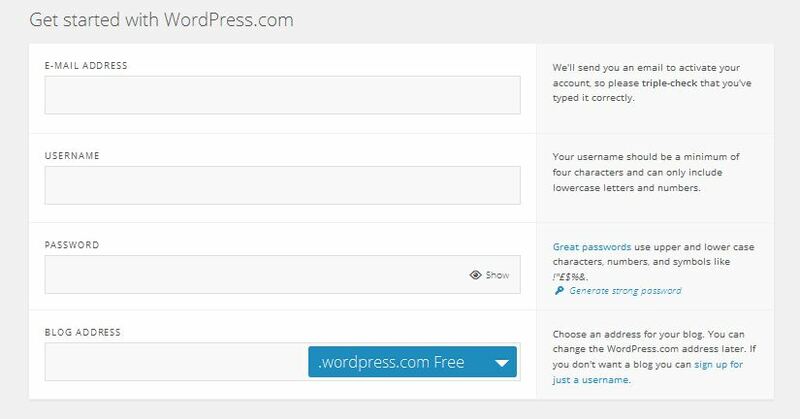 More about WordPress.com after I show you the steps. I have been using them since 2006, on multiple web sites, soooo, I speak from experience. ARE U READY to Get Your Business on the Web?? Homework Assignment: Before you sign up, think of THREE names for your web site (you never know, your top two choices might already be taken) and make sure you have a business email set up (I use Gmail). Step 2: Fill out the information requested on the top of the next page. 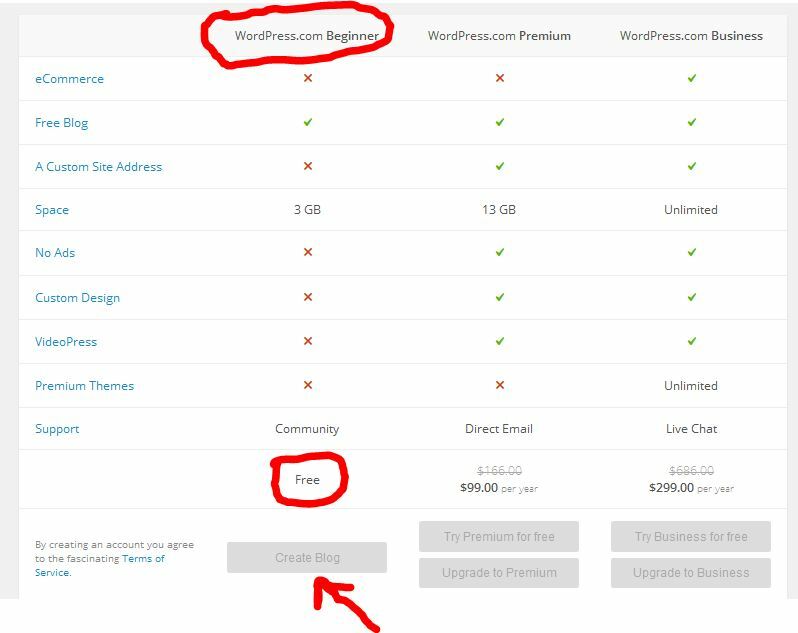 Step 3: Select the “WordPress.com Beginner” option as shown in red below. When the “Create Blog” button is available…..click on it! Web designers scrunch their eyes, smirk, and make funny noises when you tell them you are using WordPress.com for your web sites. Ignore them! All they want is to to charge you gobs of money for something you can do yourself, at least in the beginning. Flexible (with hundreds of “themes” to choose from for the look and feel you want in your web site). And the people running it are super helpful and respond quickly to problems. As a bonus….you are not stuck in “beginner” mode. If you are like me, you can add features as your skills grow, or you can move what you have built over the years to that fancy schmancy web site when you can afford it. WordPress.com is a great place to start, to grow, and, then to leave if you have to. ForCarol.com: I purchased a premium theme (Lifestyle) for this web site so I had more flexibility with respect to columns and such. This is a hybrid web site and blog. TechyMike.com: Hmmm, this web site. I keep playing with different free themes so it may change occasionally, just for fun. TechyMike is becoming a hybrid web site and blog, but, right now is primarily a blog. TracyReaderDad.com: My book review site for Thrillers and Mysteries. This is my most viewed blog. TracyReaderDad is a pure blog. AltamontCowork.com: I sold (will sell) AltamontCowork to someone on Dec 31, 2014. AltamontCowork was primarily a web site where I did a little blogging on telecommuting, coworking, etc. TechyMike offers an INTENSIVE, but FUN, FAST PACED hour on the above subject with the guarantee that you will have a web site up and running in that one hour, and know the basics of administrating it! The rest is up to you. $35 cash or check.